Mountain Laurel with a view. Traveling with friends, we wanted to reach the overlook at Grayson Highlands State Park near Whitetop, VA, before a front moved through bringing heavy rains. We just made it. We were pleasantly surprised to see not only a marvelous view but that the Mountain Laurel bushes were blooming. No other clumps of them were in blossom as we drove up the mountain. These beauties just made the view all the more impressive. The mountain range far in the distance is the Blue Ridge. 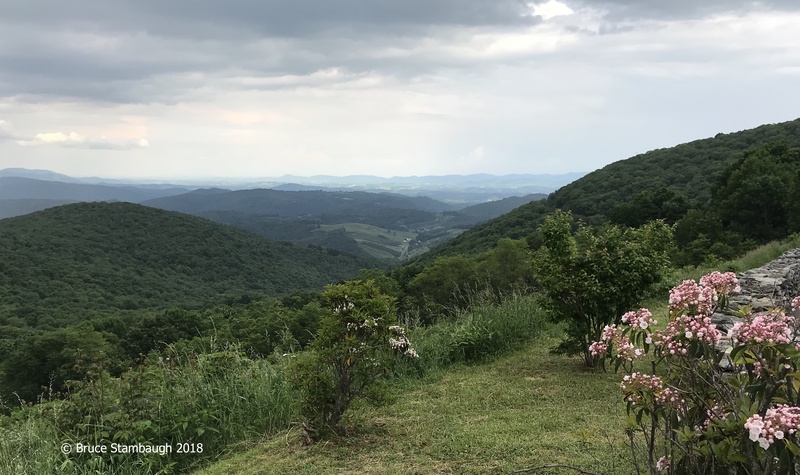 “Mountain Laurel with a view” is my Photo of the Week. That park is so amazing! It is, and I’m going back! Thanks for another great photo Bruce! The dogwoods & the mountain laurels were my 2 favorites while we lived there-sure are beautiful! Thanks, Joanne. I’m glad you liked the pic.